Orlando’s only magic dinner show! High energy standup comedy combined with astounding feats of magic and audience participation sure to tickle your funny bone. A ninety-minute experience this dinner show combines magic, comedy and audience interaction. The tropics brought to Orlando by Sea World this traditional Hawaiian Luau serving Pacific isles cuisine. Fantastic island costumes, breathtaking fire dances. You can take your family to the tropics right here in Orlando. 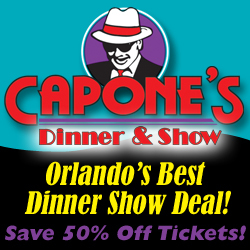 One of Orlando’s best dinner shows for families. Dinner is served family style your choice of delectable entrees and dessert.